The way coaches and their athletes communicate through this site has been significantly improved, with the addition of a commenting system and notifications for key events. Notifications are show in the top menu bar. Clicking on it brings up a list of new notifications. 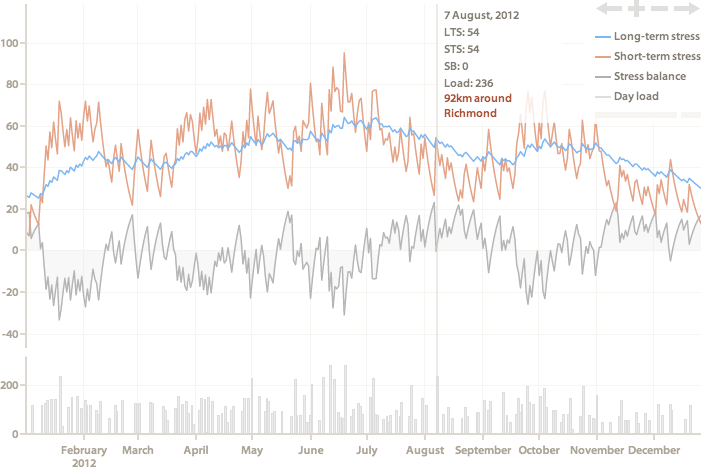 Cycling Analytics now supports the new torque effectiveness and pedal smoothness metrics. What these metrics measure is a bit complex, so we’ll first look at what they mean. This chart shows the power being applied to a pedal by a leg in a typical rotation of the cranks. It starts off positively on the downward movement, but there is a negative component in the second half of the rotation if the pedal isn’t completely unloaded or lifted up. P+ is the power pushing the pedal forward, while P− is the power pushing the pedal in the opposite direction. Pmax is the maximum power applied to the pedal during the stroke, while Pavg is the average power applied to the pedal in the stroke. Torque effectiveness measures how much of the power delivered to the pedal is pushing it forward. It is calculated as (P+ + P−) / P+ and is normally displayed as a percentage (P− will be a negative value or zero). 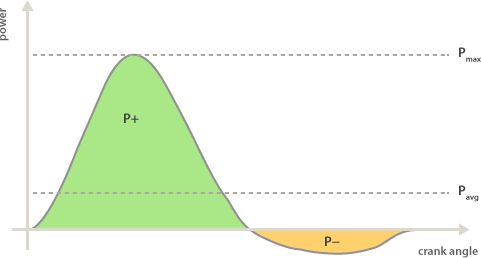 A value of 100% means that all of the power was pushing the pedal in a positive direction (therefore, P− was zero). Values of 60–100% are common. For a while it’s been possible for a coach to link their account with their athletes so that they can easily see what riding they’re doing, specify training and provide feedback. Today’s introduction of premium coaching accounts goes a step beyond this by allowing coaches to create and pay for their athletes’ accounts. Accounts created by coaches for their athletes are free to use as far as the athlete is concerned, but premium coaching accounts have a different billing model for the coaches. They cost AU$5 per month for each account controlled by the coach, including their own, with a minimum monthly spend of AU$25. For example, two athletes cost AU$25/month, ten athletes cost AU$55/month, and twenty athletes cost AU$105/month. Any account can be upgraded to a premium coaching account. First, coaching must enabled by activated coach mode. Then, on the coaching page, there’s a button to upgrade the account. Once upgraded, there is a Create new athlete button on the coaching page, which allows new athlete profiles to be created. Accounts that have been created through this can’t be deleted, but they can be disowned. This causes them to turn into regular accounts, which are no longer linked to or paid for by a coach. There are a handful of updates today, with the biggest being the introduction of summaries for weeks and months on the rides calendar. By default, summaries for weeks and months are both shown, both of which consist of the total time, distance and training load. 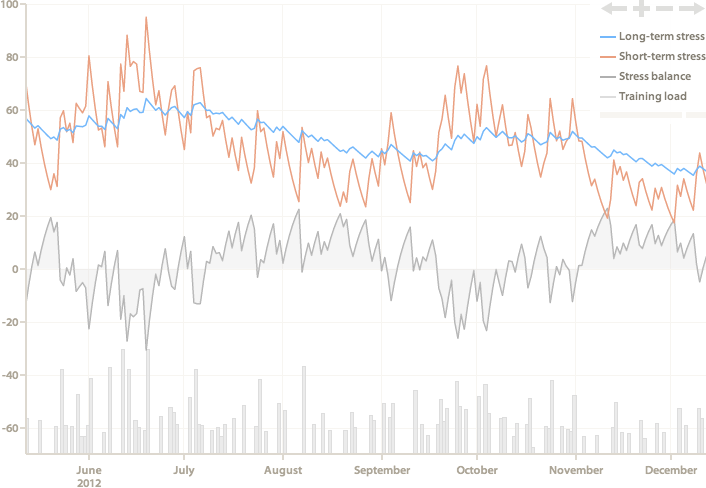 The training load sums use the same source as the training load chart, which by default is power based data (with heart rate based TRIMP scaled to equivalent values), but the source can be set manually in your profile settings. Plans are also included in summaries when they are on today’s date or later. The training load chart has also changed to behave in the same way, so it now only includes training plans that are on the current date or later. The duration of plans is also used in summaries. It magically guesses the time to use based on what’s entered, and uses the average if a range is given, so the following are all 90 minutes: 90, ~90mins, 1.5, 1.5Hrs, 1:30, 1:30:00, 1h30, 1-2, and 1 to 2 hours (hover over the duration once the plan is saved to see how it is interpreted). The default values of crank length and FTP cadence for the force vs. cadence chart can now be set on the profile settings page. Aerobic decoupling is now shown for selections on the main ride chart. Syncmetrics supports Cycling Analytics as one of the sites it synchronises sport and fitness data with. There is a suggestion for CopyMySports to support Cycling Analytics. Go there and upvote it if you want to see this done. The zoom level is kept constant when changing the zones chart between using heart rate and power data. Error codes have been added to the API for failed uploads. The training load chart has been upgraded to be much more usable. It shows the daily activity at the bottom in columns, and in the information box (clicking on the chart freezes the information box, so the rides in the information box can be clicked on to go to the ride). The load of training plans is included in the calculations. The future is shown as a dashed line. Like all of the recent charts, the wide grey bar at the bottom of the legend can be clicked on to hide the legend, or just dragged out of the way. The chart can also go full screen via the button in the thin grey bar to the right of the wide one. One other change is that the settings (i.e., initial STS and LTS values, and data source) can be changed on the profile settings page. It’s also possible to change the exponential decay rates for the long-term stress and short-term stress from the 42 day and 7 day defaults. It works by taking a ride you have ridden, and then working out what the power output for each section of the ride should be to give the fastest time for the course that you can achieve. This tool can be found at the bottom of ride pages, along with the other ride analysis tools (it’s listed as “Best Bike Split”). The first step is to enter some details about yourself, your bike and the course. 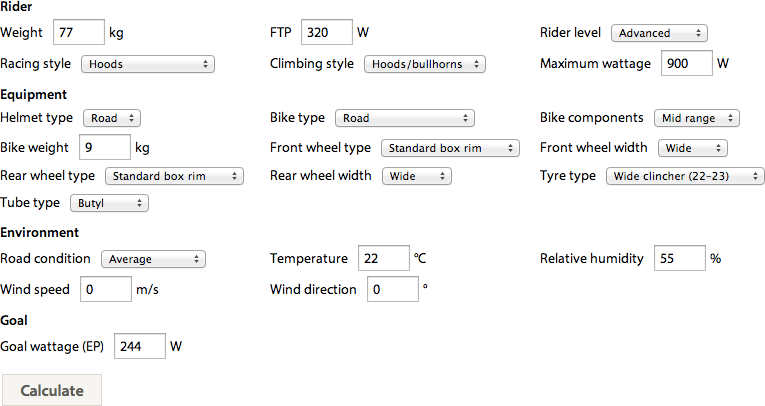 The details in the “rider” and “equipment” sections are saved (when “Calculate” is clicked) so you don’t need to keep changing them, and weight, FTP and temperature are automatically filled in. Goal wattage is by default the effective power of the ride. There are two big updates today: it’s now possible for you or your coach to specify rides in advance, and all rides can be shown on a calendar instead of a list. To get started, you need to click on New: Try the calendar view, with support for training plans on the rides page (for various reasons, training plans only work with the calendar view at the moment). This will then load a calendar of all your rides. Click on the icon at the bottom right and go directly to the ride page (this is the same as what clicking on the ride in the list does). Click anywhere else on a day and an expanded view of the day will appear. This shows all rides and training plans for the day, and new training plans can be created from here. The ride uploading interface has been upgraded. Titles and descriptions can be edited without having to go into the ride. Rides can be optionally sent to Strava (instead of always). Rides can be shared to Facebook and Twitter. The “type” and “purpose” of rides can be selected. All uploads are shown on the one map, and it highlights (and zoom in to) the ride when the title or description are being edited. The other button, between the “post to Facebook” button and the title, is a link to go directly to the ride. The numbers at the bottom (“4/4” and “100%”) show how many rides have completed processing, and what proportion of the data has been uploaded (there is a difference between the two). One caveat of sharing rides to Facebook is that this is not yet using the new “fitness” Open Graph properties, so rides won’t show up on Facebook with a nice map and summary data. Yet. This site is not yet “done”. There is a long to-do list, and here are some of the features that are planned to be worked on in the near future. The page that currently shows the list of rides is going to be entirely remade to be more flexible, more powerful, more useful, and overall, better. In addition to showing rides as a list as it currently does, it will also be able to show rides on a calendar, or on a searchable and sortable table. 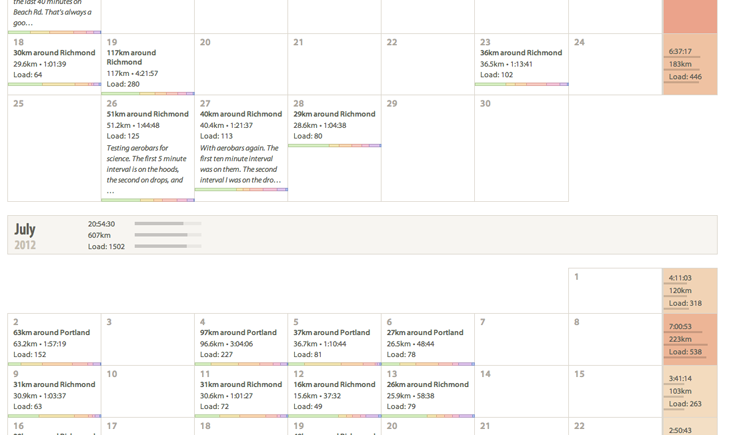 This is a screenshot of one prototype of a calendar that is currently being experimented with. 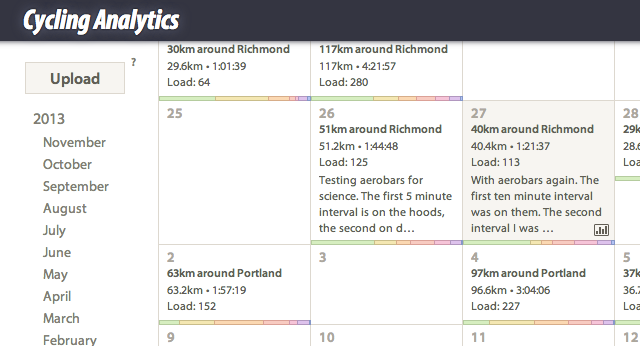 The calendar part (on the left) shows three aspects of individual rides with the number (distance), bottom bar (duration) and background colour (training load). These will be configurable, so other features of rides can be shown, such as intensity (either from power data or RPE) or whether or not it was completed according to the training plan. The middle section (the four thin columns) show the training cycles. It’s not yet finished, but the plan is to properly support training periodisation. By the way, support for training periodisation will be much more extensive than just this calendar.